Wow, there’s like room for almost another cover in there. Wonder what happened…artist drew pic at the wrong dimensions? 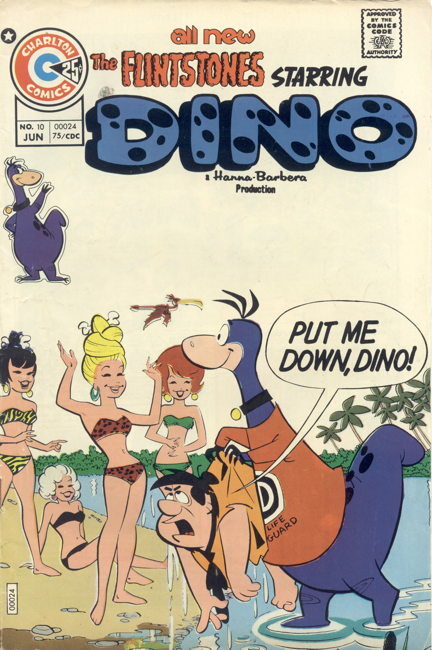 Didn’t want to lose the mini-Dino insert at the edge of the cover (necessary for easy rack identification if comics were overlapped on newsstands)? Given that it was Charlton, just plain nobody cared? Who knows? But it certainly grabbed my attention, so that cover definitely did its job and who am I to question it? The latest “Nobody’s Favorite” from pal Andrew is a comic you haven’t thought of in years. BobH has been presenting a lot of old Comic Reader covers on his Twitter feed of late…lot of great but forgotten pieces on those old ‘zines. Oh crud, I missed Ambush Bug’s birthday, but Bully the Little Birthday-Rememberin’ Bull didn’t forget! Charlton. Option C for sure. Well, they had to leave room for the cut-and-paste Dino icon in the upper left. Otherwise how would you know who this comic was about? Also, DAMES! I think it’s because the editors whited out the spaceships hovering above the scene to conceal the Flintstones-Ancient Aliens connection. Those talking birds and animals that served as appliances and the like had to come from somewhere! From my expereicne making comic book covers (for Swedish Marvel comics), I’m pretty certain someone in the print shop was supposed to at least add a color or maybe a fade to that white area, but somehow missed/forgot to do this. maybe it was re-used art from a different format, or different size.